Good: Interesting concept, Solid gold cards, Lots of cards per pack compared to most premium products, Very real big hit potential. Bad: High risk, high reward proposition, Seems a bit too much like Timeless Treasures “Gold Edition", Extremely late season release. 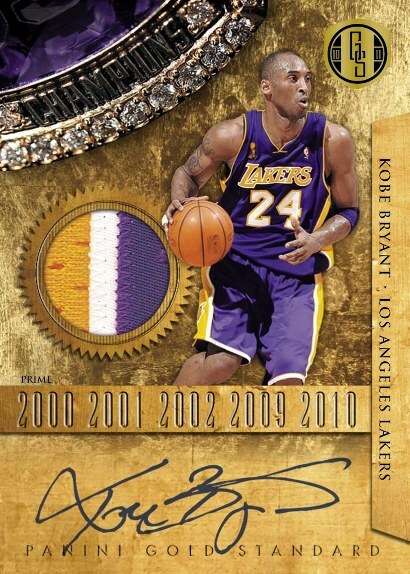 The Bottom Line: While it's certainly not a revolutionary product, 2010-11 Panini Gold Standard offers some nice high end hits and an authentic gold themed experience from start to finish. 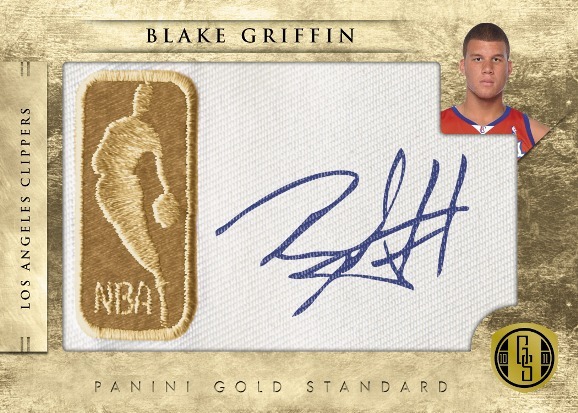 When Panini decided to name this product “Gold Standard" they really ran with the Gold theme. 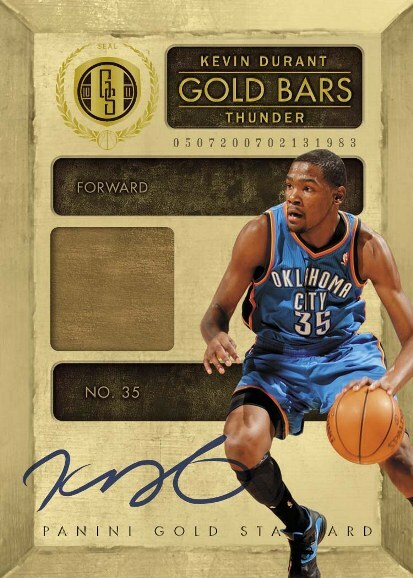 Each hobby box of 2010-11 Gold Standard is shaped like a brick of gold, which actually comes out looking pretty cool. The various subsets also feature a very golden look, but the icing on the cake is the 50 one of one solid gold cards that Panini inserted randomly throughout the production run. 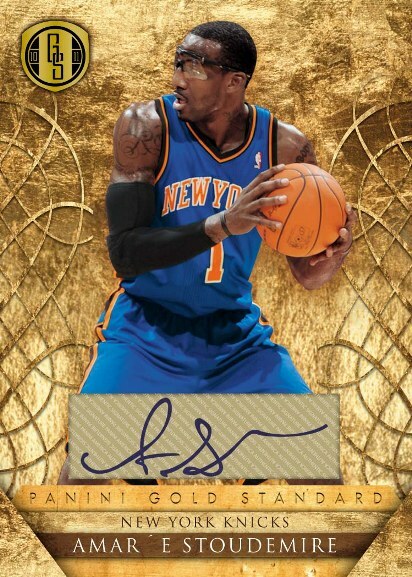 Considering the plethora of unattractive set designs that Panini has churned out since acquiring Donruss, the overall look of Gold Standard definitely represents a step in the right direction – though it looks a bit too much like Timeless Treasures Basketball (which is not necessarily a bad thing though). There's not a whole lot to complain about in the checklist department as all the requisite stars and past legends are represented in full force throughout. My one gripe is that it was released as a 2010-11 set when the 2010-11 season ended 2 months ago. So its assortment of rookie cards no longer represent real rookies at all (at least for the players who played for an NBA team last season). But 2010-11 Panini Gold Standard is far from the first set to do this, and will most certainly not be the last, so I can't hold it against them too much. 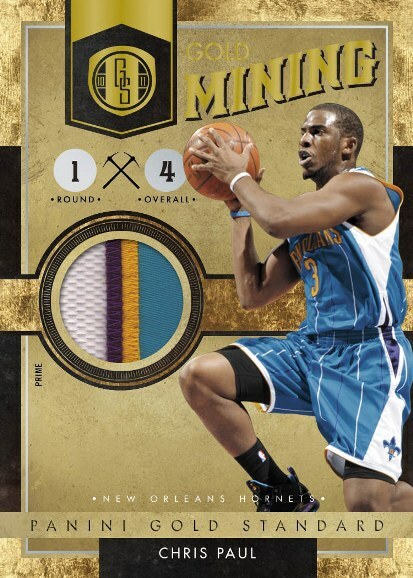 One of the things that jumped out to me about Panini Gold Standard was the sheer number of cards it contained. Most high end products have 5 cards or so per box. This has a much more robust assortment, which is a welcome addition for someone like me who enjoys getting some mileage out of each of my box breaks. Times are tight financially for many of us right now, making it difficult to pull together the funds required to purchase a hobby box of a pricey product like Gold Standard. However if you have the money and are looking for a medium risk / high reward basketball card product then this product should be on your radar. I'd stop short of calling it a “must buy", but would still give it a strong recommendation. In the end the most important question I ask myself about a product is whether it was fun to open or not. In the case of 2010-11 Gold Standard Basketball, the answer is a resounding yes. It is something a bit different with lots of big hit potential. Heck, you even have a chance to pull a solid gold card. While the latter is a longshot at best, it is sure to be a strong selling point when justifying the cost to the wife, so keep that in mind as one of your talking points. 10-11 Gold Standard Kevin Durant WARRIORS Gold Stars AUTO SSP 5! BGS 9.5 POP 1! Panini's freshman high-end hoops offering is headed to a hobby shop near you this May. The all-new product promises plenty of interesting cards including instant win Gold Tickets, Gold Rush cards featuring 14-karat gold and Logoman patches and autographs. 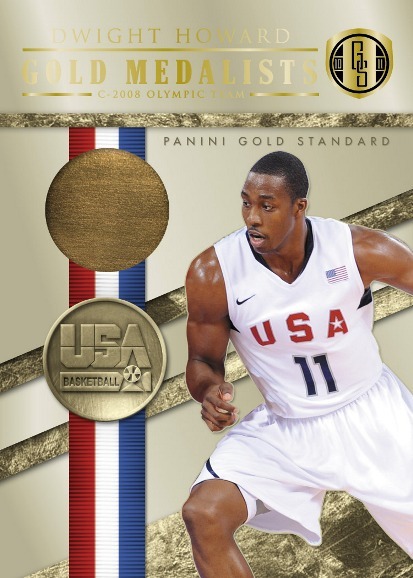 2010-11 Panini Gold Standard is set to release on 5/25/11 and will deliver 5 hits and 7 additional numbered inserts per single pack hobby box. Instant-win Golden Tickets- Win of one of five unique prizes, including a face-to-face meeting with Panini spokesman Kobe Bryant. 2 autographed Gold Logoman Patches per case. 2 autographed Gold NBA Team Logo patches per case. 1 Gold Rush card featuring a piece of 14-karat gold numbered to 10 or less per case. 1 dual autographed card per case. Early dual auto lineup includes:Kobe Bryant/Kevin Durant, Kareem Abdul-Jabbar/Bill Walton, Magic Johnson/Larry Bird, Bill Russell/Jerry West and Elgin Baylor/Oscar Robertson. At least one autograph per case from either Bryant, Durant, Bird, Russell or Magic Johnson. A 192-card set (featuring 30 autographed Rookies) augmented by 50 Solid Gold 14-karat Panini 50th Anniversary Gold Cards (each numbered to only one). “There's always a certain amount of satisfaction seeing one or more of your ideas take shape and come to fruition, especially when the concept is brand new," says Panini America NBA Brand Manager Mike Payne. “Every product developer, whatever the field, wants their fingerprints on a new product line. With Gold Standard, feedback — both internal and from other segments of the industry — was a key element in shaping the product and turning it into something that might have a chance at a long shelf life."